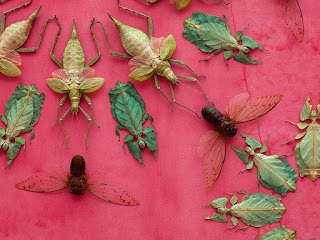 There are countless artists who render insects and other animals with traditional media like pen, ink, pencil, paints, clay, wood, and other materials, creating a realistic representation of the organism itself or, alternatively, a whimsical or inspired interpretation thereof. 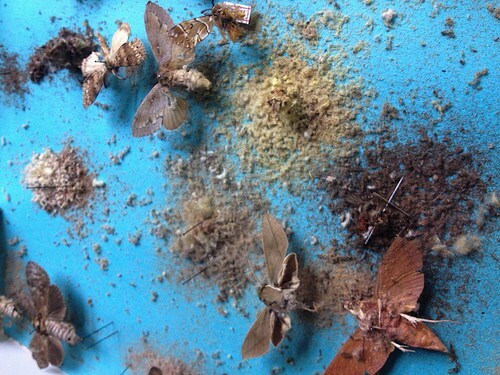 What, then, do we make of art that uses deceased life forms as the medium? Your appreciation, or disapproval, may hinge on one or more facets of personal taste or ethics. Have we given collective thought to the implications of such works? Maybe we should. People tend to place animals into one or more general categories. One category is reserved for other species that benefit people directly, and usually economically, though often framed as pets or companions for which we like to think there is no "price" we could assign to those individual animals. Ideally, when it comes to animals, art is a way to enhance the appreciation of other species, encourage us to think differently about them, inform us as to their unique behaviors and place in the bigger picture (outside the frame, if you will), and inspire us to learn more once we leave the gallery. I personally know dozens of artists who share that intent, and who execute amazing works. I also know artists for whom I assume that is the foundation of their works, but who use insects themselves as raw material for their works. This begins to make me feel uncomfortable. 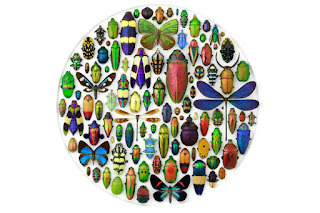 The overwhelming message I receive from artwork composed of dead insects or their body parts is that the creature itself is not a complete expression of beauty unless it is modified by human hands into something "greater." I am quite certain this thought never crosses the mind of the artist, and that is understandable. I might even go so far as to say it is human nature to have the desire to "improve" other objects, other species. Look at every domesticated animal, every plant cultivar. The second ethical aspect of turning deceased animals into art has to do with sourcing. Where did the specimens come from? The acclaimed artist Damien Hirst is currently creating art from dead butterflies, carefully removing the wings and applying them to boards in colorful patterns. He obtains specimens by purchasing old collections. Re-using and repurposing, so what is so bad about that? Nothing, if the collections have no scientific value, but a travesty if the specimens had location data with them. They belong in museums in that event. Other artists use "farmed" specimens bred in captivity so there is no detriment to wild populations. An absolute purist would argue that even the best sourcing of specimens is still taking away from the carbon and nutrient cycles that other organisms benefit from. 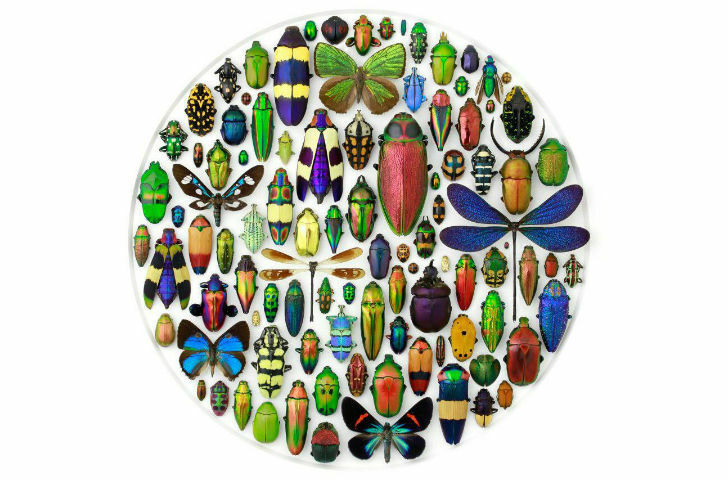 Hirst and other artists might consider simply putting out dead insects and letting carpet beetles and booklice reduce them to powder that can then be used to create more art. What an installation that would be, to bring awareness to the natural process of decay. The final insult, and I would welcome a better word, is that the artist employing organisms or their parts makes money from the exploitation of nature's works. Artists might consider donating at least a percentage of income to wildlife conservation organizations for the protection of the living versions of the dead ones they use in their works. Maybe, like Christopher Marley, they do and it is simply not widespread public knowledge. Artists have the power to change our minds, our attitudes, and our behaviors, but it would be nice to see more respectful methods in the madness. More murals. Huge insect images like the ones rendered by Portugese artist Sergio Odeith. Spectacular glassworks like those of Rafael Glass. The real creative challenge, then, is finding new ways to exhalt nature without exploiting her. It can be done. I have faith that way. I could picture my bones on a forest floor, serving as a substrate for lichens. That would be art, too. I am sure that would be illegal. I am part way through Life Everlasting by Bernd Heinrich--interesting perspective. I need to find the book and finish it up. Didn't mean to get so morbid--just where my mind was at the moment. I don't find that morbid at all. Thanks for sharing! Thanks for pointing out my mistake. I also mention dermestid beetles in my novel, Penniless Souls. Great post. You bring up many good points and have clearly thought of it quite carefully. I don't personally consider it a problem for an artist to make money from their work when using animal remains (insects or otherwise) as their medium. They do get to make a living or supplement their living, and when their work is in public view that is one way for the general public to keep nature in mind. Of course the ethical balance tips to the irredeemable negative if the subjects were taken from the wild and are from declining populations. There is nothing tolerable in that of course. Thank you for the compliments and sharing your own perspective.